Because there aren’t quite enough articles encouraging people to give up smoking already, here’s another one. But we’re not here to tell you about the (obvious and well-documented) perils cigarettes can wreak upon your health, we’re appealing to your vanity. These are some of the key effects smoking has on our looks – including premature ageing, going grey early and hair loss. 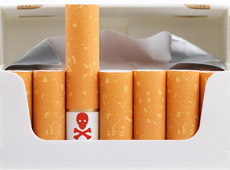 Whilst these generally refer to chronic or ‘heavy’ smoking, classified as 20 or more cigarettes per day, the effects can also be seen in more moderate smokers and light smokers don’t get off scott free either… Interestingly, because some of these effects are the result of tobacco smoke, repeated passive smoking can also result in similar problems in certain instances. Studies have shown that smoking can cause sagging skin under the eyes. These bags under the eyes are thought to be worsened in smokers due to collagen production – necessary for skin elasticity – being negatively affected by the ingredients found in cigarettes. These can destroy collagen and elastin, leading to saggy skin all over the body, not just the under-eyes, and deeper wrinkles. Crows feet and deep lines at the outer corners of eyes are also more common and from an earlier age in smokers. It’s not just eye bags that ‘cancer sticks’ can have a hand in; smoking has been identified as one of the leading causes of sagging breasts. It can also cause ‘bingo wings’ – droopy upper arm skin – again, due to the way the chemicals in cigarettes target the proteins that help to keep skin strong and promote elasticity. This is also the science researchers have found to be behind accelerated skin ageing and impaired wound-healing in smokers and chronic passive smokers. Skin that starts to look pale and, in older smokers, may also develop an uneven tone is considered the result of chronic smokers’ depleted nutrients and oxygen levels. In addition to having a pallid appearance, the skin may also look ashen and dry for the same reasons. Because of the repeated sucking motion lips are required to perform when smoking, combined with the aforementioned drop in skin suppleness and strength, smokers are likely to have vertical lines form around their mouth. These can be deep ridges and are rarely seen in non-smokers. Age spots, darkened patches that tend to appear on the skin as we age, are known to be accelerated by repeated sun exposure. However, researchers believe smokers are particularly at risk of developing age spots. Due to smokers being more at risk of developing brittle bones than non-smokers, they may develop a hunched back or stoop, which is one of the key outwardly visible signs of this condition. Smoking is responsible for a number of oral complications, from gingivitis and bad breath to smokers being more likely to lose teeth than non-smokers. And then there’s the tobacco staining… yellow teeth, fingernails and finger tips are all part of the package for smokers thanks to the tar and nicotine contained in cigarettes. Smoking has been linked to hair going grey prematurely in a number of clinical studies. Research from a 2013 study, published in the Indian Dermatology Journal, stated there is a ‘significant relation’ between cigarette smoking and hair turning grey before 30 years of age. With smokers being two and a half more times likely to find their hair going prematurely grey than non-smokers. As premature hair greying has traditionally been seen as a side effect of certain health issues, including autoimmune disease and conditions which cause premature ageing, scientists believe there may be a correlation between smokers’ hair turning grey before 30 years of age and the early ageing of their organs. This may, in turn, suggest a shorter lifespan. Psoriasis is a chronic autoimmune skin condition which causes flaky patches of red and silver ‘scales’. It tends to appear most commonly on the elbows, knees, hands, feet, back and scalp. Research has shown psoriasis is more prevalent in smokers. Studies have linked smoking to both thinning hair in men and women from temporary hair loss conditions, to the permanent hereditary condition Male Pattern Baldness. Tobacco smoke has a similar ‘drying’ effect on the body as persistent stress; its effects can cause extra strain which may disrupt the normal functioning of the hair growth cycle, furthermore the chemicals contained in that smoke can directly damage the hair follicles’ DNA. This can result in diffusely thinning hair from all over the scalp – typically from Telogen Effluvium – or, for those with active Male or Female Pattern Hair Loss, their shedding may intensify. Furthermore, for those with an underlying genetic predisposition towards Male or Female Pattern Baldness, the conditions’ onset may be prematurely triggered by the effects of smoking on the body. Oxidative stress, cell damage which can arise from smoking among other environmental and lifestyle causes, has also been shown in two recent studies to contribute to premature Male Pattern Baldness. Smoking is also believed to result in drier hair that may be weaker and more brittle, which can also make it look thin, as a result of the decreased level of nutrients it receives. 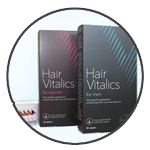 Whilst ensuring a good balanced diet filled with hair-friendly vitamins, minerals and amino acids, which may be topped up with a highly-targeted hair supplement such as Hair Vitalics if desired, may help smokers’ hair to look healthier than it might otherwise, giving up smoking is one of the best things you can do to help your hair reach its full potential. For those worried about thinning hair – regardless of whether they smoke or not – a consultation with a professional can be a source of both information and comfort. A dedicated hair loss specialist can carry out a scalp assessment and take a brief medical history before making a diagnosis and recommending a personalised hair loss treatment course tailored to their findings and the patient’s individual requirements.